If you do not have any active issues or have recently completed treatment, it is still important to be on a recall schedule for preventive maintenance (check-ups and cleanings). This allows our team to monitor your health to ensure that no new disease process has started. What is the difference between a regular cleaning and deep cleaning? Adult prophylaxis (regular cleaning) is done when the health of the gum tissues is ideal. Deep cleaning (scaling and root planing) must be done when there are deep pockets in the gum tissue and lots of associated bleeding. How often should I receive regular cleanings? Cleanings should be done every six months to ensure that the teeth and gum tissues maintain their state of health. How often should I receive deep cleanings? The pocket depths of the gum tissue around the teeth is too deep to be effectively cleaned with floss and a toothbrush. As a result, deep cleanings should be completed every three months to ensure that the health of the gum tissues does not deteriorate further. If a strict hygiene schedule is not kept, then it is more likely that the affected teeth will be lost due to periodontal disease. What is the proper way to brush and floss? The most effective way to brush your teeth is twice daily with fluoride toothpaste and an electric toothbrush for two minutes. Ideally, you should brush your teeth after every meal(! ), but at minimum it is recommended that you brush twice a day. An electric toothbrush is helpful because it is programmed to run for two minutes. In order to stop brushing before two minutes is up, you must consciously turn the toothbrush off before it’s time. Flossing does not need to be done as often as brushing, but it is recommended to floss once daily. I have heard that fluoride is bad for me. Is that true? The concentrations of fluoride in over-the-counter toothpastes is not harmful when used appropriately. The biggest harm that can be done is by ignoring toothpaste instructions: do not ingest fluoride toothpastes. Follow this simple rule and you will be fine. What is the difference between mouth, sports, and night guards? A sports guard is the most different of the group. It typically is made from a soft, thicker material. This is effective for sports because the thick and soft guard absorbs and dissipates impact forces more effectively. 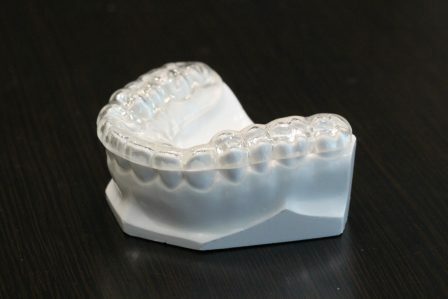 Mouth and night guards are similar and interchangeable. The difference being the time when it is used: either at night or during the day. Why do I need a mouth/night guard? A mouth/night guard has been recommended because you show signs of clenching or grinding. The most characteristic feature of clenching and grinding is sharp, flat surfaces of the teeth. These occur on both the upper and lower teeth, and are called wear facets.